KIEV, Ukraine -- Escalating military action and sanctions are forcing executives around the globe to map out scenarios to safeguard employees, supply chains and assets within and beyond the borders of Ukraine and Russia. 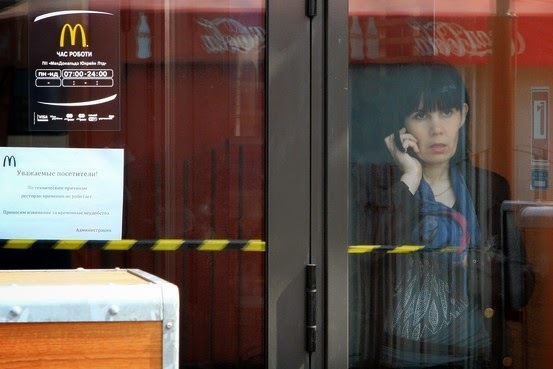 A woman inside a McDonald's in Simferopol, in Crimea stands next to a notice this month that the restaurant has suspended operations in the city. Carnival Corp.'s cruise ships now call in Bulgaria instead of Ukraine. McDonald's Corp. has closed its restaurants in Crimea. French airline Aigle Azur postponed plans for new flights from Paris to Beijing because Russia denied access to its airspace. Canadian snowmobile maker BRP Inc. is discounting prices for its main Russian distributor to ease the currency squeeze. While Ukraine's gross domestic product is roughly the size of Alabama's, the economic spillover effect of rising political tension is hard to gauge. More than 100 public companies have mentioned the crisis on conference calls with investors since Jan. 1, according to transcripts provided by FactSet. "This is one where you watch it unfolding and it may get worse before it gets better," said Ken Goldman, chief financial officer of Black Duck Software Inc. The international software firm has developers in Romania and Moldova who account for 15% of production. "We look at it and say, 'If tomorrow we couldn't reach people in those locations, if communication was cut off or the people were told to go home until it was safe, what happens to us? How do we make sure whatever they are working on is also back here?' We are not worried about losing information; we are worried about losing productivity." He said the company could move that work to its headquarters near Boston or its operations in India within 48 hours. Wolters Kluwer, a Dutch-based international provider of software and services, has small legal and regulatory publishing businesses in Russia and Ukraine. They were growing fast, but forecasting now is difficult. Any business disruption would be hard to offset by moving employees or production, said Kevin Entricken, the company's CFO, because the subject matter is so specific to the jurisdictions. "Anybody who operates in Europe is watching the crisis in Ukraine with a lot of interest," Mr. Entricken said. "We have seen the rate of decline in Europe overall and anytime there is uncertainly, it may present challenges." Already, investor optimism is fading. In Germany, Europe's largest economy and one of Russia's primary trading partners, government data this week showed investor confidence fell for the fourth month in a row in April. One of the big unknowns is the extent to which current or future sanctions against Russian and Ukrainian power brokers—and any retaliation—will affect energy prices, interest or inflation rates in the region. U.S. and European leaders have said they want to expand sanctions beyond their current lists. "Estimating the sanctions is like shooting in the air," said Pascal Bossé, spokesman for BRP. Then there is the question of foreign-exchange rates. BRP expects its snowmobile sales in Russia to drop 20% this year because the declining value of the ruble has made its vehicles, which are priced in euros, too expensive for a lot of buyers. Eastern Europe is the company's fourth-largest market, and the lost orders are expected to shave 10 cents a share from the company's fiscal full-year earnings. Of course with almost any crisis come business opportunities. European leaders, for example, appear motivated to create a cohesive, regional energy policy as well as to strengthen trade ties with the U.S.
"Now, when you engage with policy makers [on energy issues] they really want to know what your ideas and thoughts are," said one senior executive with a large U.S. multinational company, who asked not to be named because he wasn't authorized to speak publicly about the discussions. "There is a feeling of greater urgency. They are coming to grips with reality. Something needs to happen." International companies are also becoming practiced at contingency planning, following years of political and civil unrest in numerous countries, including Egypt, Indonesia and Venezuela. "Geopolitical issues happen periodically, almost every year somewhere," Arnold Donald, president and chief operating officer of Carnival, told investors. Multinational companies have taken steps to reduce their exposure to Russia in recent weeks, including pulling money out of the country and cooling expansion plans, said Cliff Kupchan, senior Russia analyst at the Eurasia Group, a risk consultancy based in New York. Mr. Kupchan served in the Clinton administration as the State Department's deputy coordinator of U.S. assistance to Eurasia. Companies and banks pulled out almost $70 billion during the first quarter. That is more than they took out for all of last year, according to the Russian Central Bank. Mr. Kupchan warned that if the West slaps severe trade and financial sanctions on Russia, then President Vladimir Putin would extract some pain from the multinationals within his borders, either by freezing their assets or disrupting their supply chains. Businesses need to have contingency plans for that, he said, because "Russia can really screw them up."